The Journal of Tourism and Leisure Studies provides an international and interdisciplinary forum for scholarly studies in tourism and leisure studies. Articles may be focused within disciplinary boundaries, however, many also take an interdisciplinary approach, at times necessarily so given the complex and expansive nature of the questions raised. 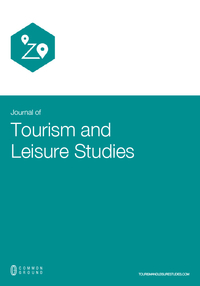 The Journal of Tourism and Leisure Studies is peer-reviewed, supported by rigorous processes of criterion-referenced article ranking and qualitative commentary, ensuring that only intellectual work of the greatest substance and highest significance is published. The Journal of Tourism and Leisure Studies currently has a 14% acceptance rate, based on 2017 statistics. Review scores are based on a clearly articulated rubric, and the result is a peer-review process that is scrupulously fair in its assessments, while at the same time offering carefully structured and constructive feedback that enhances the quality of the published article. Each year a top-ranked article from the Journal of Tourism and Leisure Studies receives the International Award for Excellence. We are committed to expanding the visibility, reach, and impact of research from the Tourism and Leisure Studies Research Network. Journals in the Journal of Tourism and Leisure Studies can be found in numerous databases, accessible via the libraries of institutional subscribers, and in the CG Scholar Bookstore for current Research Network Members. Crossref is a not-for-profit membership organization for scholarly publishing. Crossref and its members work to make content easy to find, link, cite, and assess by using online tools and services to improve research communications. Crossref’s goal is to be a trusted collaborative organization with broad network connections; authoritative and innovative in support of a persistent, sustainable infrastructure for scholarly communication.